Kick-start your healthy lifestyle with Formula 1 Select Nutritional Shake Mix. A delicious and easy way to treat your body to a nutritious and balanced meal in no time. 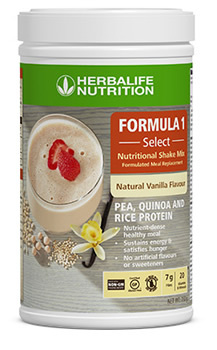 With a mix of pea, quinoa and rice proteins and over 20 vitamins and minerals in each serving, Formula 1 Select helps fill important nutritional gaps. It also provides up to 7 grams of fibre per serving. Add Formula 1 Select to your routine to get the essential, balanced nutrition your body needs every day. Pea protein, Inulin, Fructose powder, Rice protein concentrate, Quinoa seed powder, Natural vanilla flavour, Guar gum powder, Dibasic calcium phosphate, Canola oil, Potassium phosphate, Medium chain triglycerides, Rice fibre, Magnesium oxide, Ascorbic acid, Stevia, Di-alpha tocopheryl acetate, Ginger root powder, honey powder, Beta carotene, Blueberry powder, Cranberry powder, Ferrous fumarate, Zinc oxide, Niacinamide, Potassium Iodide, Cyanocobalamin, Cholecalciferol, Pyridoxine hydrochloride, Riboflavin, Calcium pantothenate, Magnesium sulfate, Thiamin mononitrate, Vitamin K, Folic acid, Biotin. Herbalife Formula 1 can be used to lose weight, gain weight or as a healthy supplement when weight change is not sought. Blend or stir 30g of Formula 1 with 320 ml of your favourite protein beverage, skim milk or soy milk. Add fresh or frozen fruit and ice as desired. To lose weight, replace two meals per day with a healthy Formula 1 shake. We also recommend you take a look at the Herbalife weight loss programmes. To gain weight, take three shakes per day in addition to your three meals. It is also recommended that you boost the protein content with Personalised Protein Powder. To maintain weight or just as a healthy breakfast, take one shake per day to replace one meal.